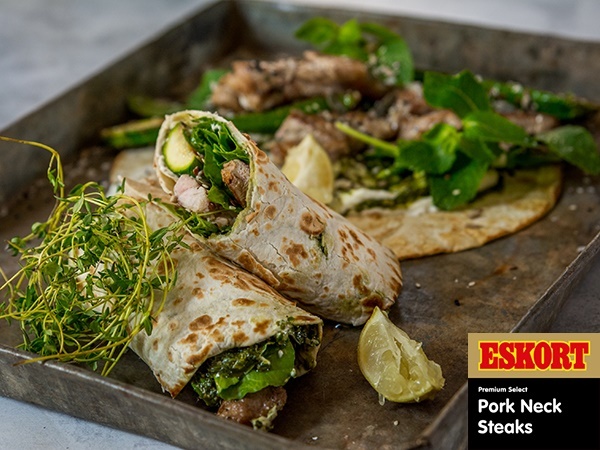 Filled with #JustDelicious juicy pork, fresh greens and a delightful basil pesto dressing, this wrap really steals the show! Heat some olive oil in a pan over moderate heat. Season the pork strips with salt, pepper and thyme and fry until cooked and browned. Add the pork strips to a bowl, dress with the lime zest and juice and mix to ensure even coating. Set aside. Season the baby marrow halves with salt and pepper and fry in the same pan strips until crispy and golden. In the centre of each wrap, add a dollop of yoghurt and a teaspoon of basil pesto. Use the bottom of the spoon to combine the two while spreading the mixture around. Add a portion of baby spinach, mint, pork strips and baby marrows to the centre of each wrap and garnish with a tablespoon of seeds. Do not overstuff wraps. Fold each side over and serve fresh or toasted. Heat a large frying pan or grill pan over medium heat, lightly brush the pan with olive oil and place the wraps seam side down. Gently brush the top of the wraps with olive oil and turn every minute or two until crispy all sides. Cover each wrap in a length of foil, twisting the ends to close. Cut each wrap in half and place in a lunch box.